Welcome to Tearmon Cottage, Erris Peninsula! Tearmon is located on the Wild Atlantic Way and is in a designated Special Area of Conservation and surrounded by a large Bird Sanctuary. If you're stressed out and in need of peace tranquility this is the place to stay for you! Morning and evening bird songs surround the cottage and fill the air with sweet sounds to enhance and enliven the inner spirit. Tearmon is a comfortable and well equipped cottage with great view of Scotchport and the Eagle Island Lighthouse. The quiet area offers lots of level to moderate walks and cycling. There's a superb links Golf Course at Carne, anglers find salmon and trout in the local rivers or can go on chartered sea angling boat trips; the miles of beaches and the clear waters are perfect for surfing, diving, kayaking and swimming. There are two bedrooms, a nice upstairs snug with a view across another bay and comfy chairs and lights for reading; a spacious living room (part of which has plenty of windows with views to the nearby bay) and a separate well equipped kitchen. The caretaker lives very nearby and is readily available. There's a small shop in the next village for your daily needs. 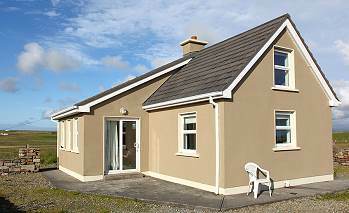 Fantastic location, wonderfully well equipped and beautiful cottage. Ideal if you like walks, beaches, water sports, wildlife, relaxation and an odd pint at Lavelles in Corclough nearby!! Great views from the cottage of two superb beaches aswell as views of the mountains, bird sanctuary, lighthouse and the stunning unspoilt ocean sky's day and night. Highly recommended.